The arguments for and against camphor laurel are once again being aired. This, I think reflects more about how humans live at such odds with each other, with the environment only as a vague back drop. I had 20 established and immature camphors growing here when I returned to the property 22 years ago. I chopped them down and then continued by touring these stumps every 3 weeks when I would break off any new growth. Within a year most stumps had succumbed and had begun to break down. This approach had 2 major advantages, I wasn’t poisoning the soil – as camphor roots can extend 30 metres in any direction and any poison used will carry to the roots extent, ( any sprouting from these extended roots I broke off ). The other advantage was that I was able to closely observe what was beginning to grow around the disabled camphor. As more moisture was made available rain forest seeds, such as pencil and red cedar, celery wood and tamarind, sprouted. Now, with the decline of the white-headed pigeon in this valley over the last 5 years, I am not seeing any camphor seedlings beneath where the pigeons roosted. 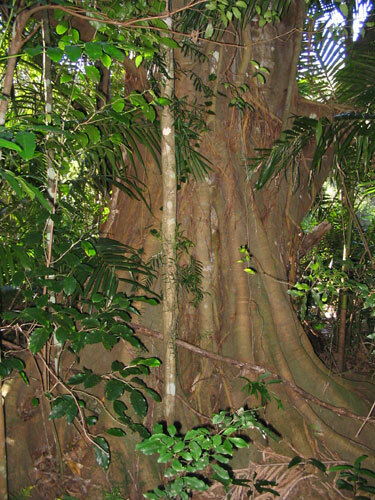 If I now see a lone camphor in the rain forest I leave it, simply because the surrounding canopy will contain it. I probably wouldn’t remove the camphor trees now as I did way back then. There was so much misinformation peddled and its only been my acceptance of observing nature as my teacher over the years I see how wrong some of my earlier approaches to regeneration were. A 1788er then, an idealized vision of “how it was” was so smug and arrogant. Nature is always in flux and with the vast niches humans created with our rush to turn Australia into some European ideal, its great that there are species to fill those niches and protect what is left of our fragile soil. With their naturalization in this Shire, the camphor laurels existence has provided survival for many birds whom Europeans deprived of their original food source when whole sale clearance began of the native forests. Any growing tree is storing carbon. Also, scientists who have studied the insect life existing from the camphor, have found a great variety. When we were removing jump-seed from the public road sides, to prevent whole sale spraying with herbicides, we were often accompanied by the Black cockatoo with their young who feast on the ripening fruit. What I find difficult in the local argument is why haven’t we established small-scale milling enterprises ? With imported wood now surrounded by environmental, ethical and sustainability questions, why aren’t we sustainably harvesting camphor for domestic furniture plus and returning the land to either food production or new forest ? As Stephen Jay Gould said ( one of the planet’s great evolutionary biologists) ‘ punctuated equilibrium’, and that evolution wasn’t a continual process but happened mostly in bursts after major disruptions. He went on to say that ecologists were wrong to see anything as innately superior about stable ecosystems because disruption was essential to evolution. It provided chances for new species to evolve. Similarly, the notion that’ native must be best, for native has been honed to optimality in the refiner’s fire of Darwinian competition’ was a ‘persuasive misreading of natural selection, and an evolutionary fallacy.